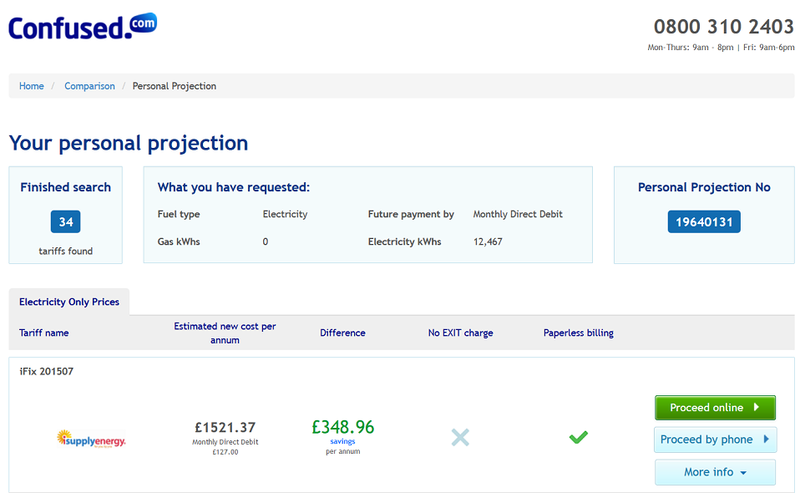 While I’ve been enjoying a bit of a career break and working through the bucket list, I’ve also steadily been making my life ‘to do’ list a little bit shorter – which included such tasks as switching energy supplier to save a bit of money (every little helps as someone once said). After all, to me my energy supply has been nothing but a financial outgoing – other than my lights going on when I want them to (which is actually an achievement given some of the electrics in my flat!) it meant nothing else to me, regardless of what the supplier (E.on in my case) might be investing in renewable energy, green targets, corporate responsibility or any other activities (regardless of their value as a responsible business). Which I have always personally thought was a hefty chunk of change for a small two bedroom flat. No, I hadn’t heard of them either – but as it was just a billing relationship to me, I thought “why not just go with them” [as you can see, is a fairly hefty saving] and I kicked off my switching of supplier by entering a few details on the site and soon had an e-mail from the provider stating I was confirmed as having changed supplier and that it would all go through around 6 weeks later. 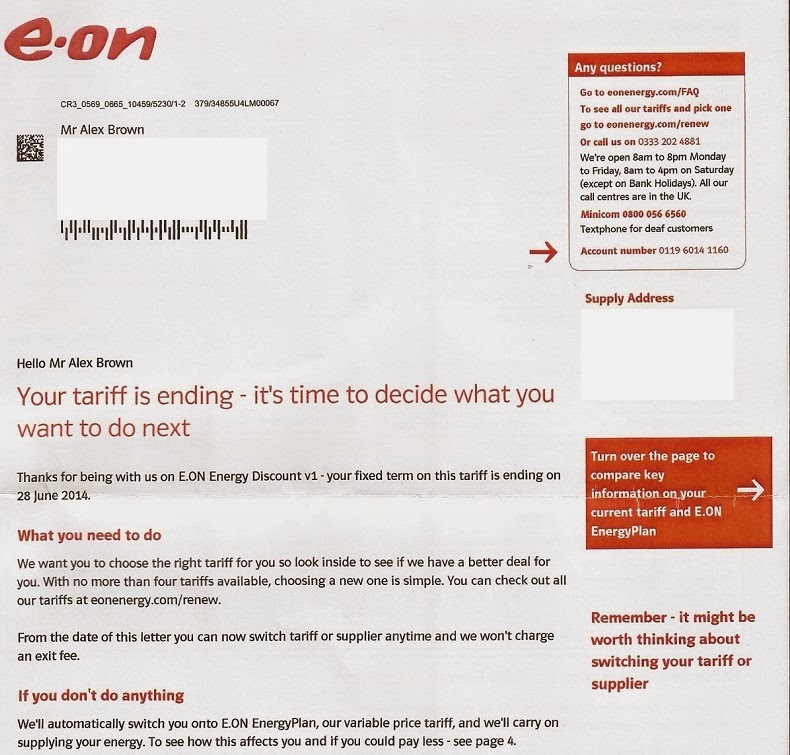 Now I have no doubt that they are required to send this by their regulator Ofgem, and that there is no way that they would have stirred me up to look around like this if there was any way that they could have avoided highlighted it to me – but I am also minded of what would have made me stay? This has got to be a retention challenge for anyone in a gaining supplier led switchers’ market such as energy or personal banking and from experience the only real way to limit it has got to be to play back the value of what you already have as a customer (aka value reinforcement) before the event of them even thinking about moving on. Make no mistakes – that’s really hard in an environment when you don’t get the opportunity to speak to the customer to prevent their churn before they move on, but at the same time learnings can be taken from markets that require the consumer to speak to their supplier before they can leave (or at least make it much easier to leave if they do have a conversation). In my experience in cable, a few of us got our heads together (data gurus, marketeers and Customer Experience people) to come up with a concept focused on churn prevention that we called ‘Brilliance as Standard’. It’s actually a really simple and relatively easy to implement solution as long as you have the data to back it up and the persistence to stick with it in messaging over a period of time. BAS was based on what consumers talk about themselves with regards to your products or services as to what the most important non price related things are to them – i.e. the reasons that they stay with you, spend more money with you and don’t leave to head off to your competitors. In our case it was the inherent advantages of the network and the way it had been invested in (i.e. the fastest available broadband around), the fact that we were the only provider that bundled in premium football sports channels (for top tier customers) and that a customer got free service & repairs if things did break (competitors often charging to replace telly boxes for example) – the stuff that consumers told us were the most important to them, that are their differentiators and that they based their provider decisions on. It all came from NPS® verbatim comments and clever key word analysis, and really was effective in helping limit churn requests at sensitive times such as when prices went up – and was embedded in all communications you’d receive as an existing customer. In fact many of the messages even resonated for new punters, hence you still see them occasionally popping up on billboards and in TV adverts around the place. So, taking this lesson on board, I have been thinking of how my energy company might have limited their churn impact when they don’t get to discuss with the departing customer (i.e. preventing it in the first place). Any other key corporate responsibility messages? Would any of this made the difference for me? If highlighted over a period of 2-3 years at all key touchpoints (online, my bill, in advertisements, on billboards, by their customer service agents when I spoke to them – never forget the power of what your people say to your customers) I think there’s every chance that they might have – or if not, they may have with others, which has got to be worth a punt in a market where switching is so easy. Now let’s see what they can tell me about what else they do before I decide whether to switch again next year.